Figure 5. 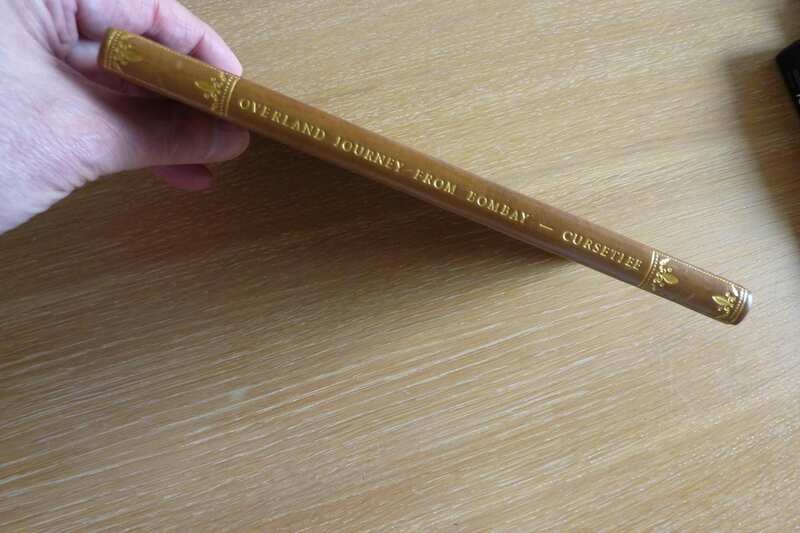 Spine of Ardaseer Cursetjee’s Diary of an overland journey from Bombay to England. Image courtesy of Blair Southerden. It was perhaps the Governor’s delighted response to Ardaseer’s domestic invention, as much as his achievements in steam machinery that gave Ardaseer the courage in 1835 to apply to for permission to accompany the Governor to England. In his Diary he explained: ‘Having already spent several years in scientific pursuits of public utility, it was my great ambition to visit England for a short time, to make myself better acquainted with the resources of that powerful country’. The Governor, the Earl of Clare did not however approve this application and recommended that he wait awhile. Following his departure severe illness compelled Ardaseer to leave the island of Bombay. It is unclear why he chose to take a trip to China, and no record exists of his time there, although he was elected a non-resident member of the Royal Asiatic Society in 1837. Ill health was to beset him again in 1838, when his renewed request to visit England was granted. He finally made it to England in 1839, sailing on the steam ship the Berenice, leaving behind his wife (and distant cousin), Awahbai Nowrojee Nusserwanji, his two sons Rustomjee (1828-1893) and Nusserwanjee (1833-1891) and daughter Ruttonbai (1830-1899). His second daughter Soonabai was born that year. His request for financial support from the East India Company, made on his arrival in England, was rewarded with an allowance of £1 a day for subsistence. His salary of 79 rupees a month (equivalent to £95 per annum) barely covered his sea passage, and he calculated that his expenses in getting to England had cost him the equivalent of three year’s salary. Figure 6. Image of frontispiece to Ardaseer Cursetjee’s Diary of an overland journey from Bombay to England. Image courtesy of Blair Southerden. The second element in his stay was his presence at important occasions, such as his attendance at the illuminations in the City and Whitehall celebrating the wedding of Queen Victoria in February 1840 and his presentation to her in July that year. He also gave evidence to a Committee of the House of Commons on the subject of the opium trade with China, in which Bombay merchants were prominent, which may explain why he went to China in 1835. The Committee’s investigations had been precipitated six months before Ardaseer Cursetjee’s departure for England when local officials at Canton had seized over 20,000 bales of opium from British merchants on the instructions of the Chinese government. He was questioned in his capacity as a Parsi recently come from Bombay who was knowledgeable about trading activities. He described the harm that the seizure had caused Parsi merchants in Bombay as a consequence of being unable to settle debts. The reports from this Committee were a precursor to the action taken later by Lord Palmerston, which started the first Opium War with China. 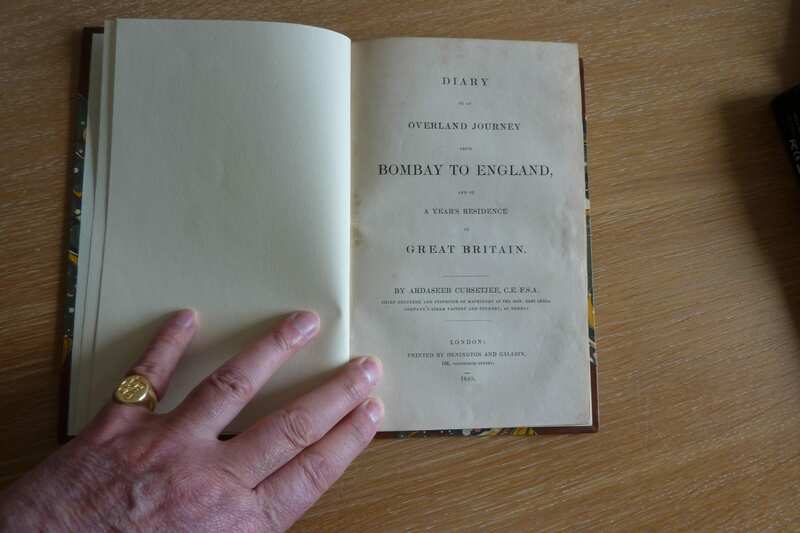 The authors of the Account made it clear that the purpose of the publication was to provide a ‘bird’s eye view, as it were of what we have seen from 29 March 1838 the day we left Bombay, until April 1841’ as a guide for other Indians who might want to visit Britain. They were struck by the number of omnibuses in London. They comment in detail on ‘the great length of time that is everyday occupied at meals by the English people’, listing half an hour for breakfast, two hours for dinner, half an hour for an afternoon meal and a further half an hour for supper. ‘Now this consumes nearly a quarter of their time and does appear to us, to be a very great waste of that valuable commodity’. They drew a ‘quiet picture of everyday life of a family’, being particularly impressed by female education that enhanced such life, and hoped that this might ‘induce mothers in India … to establish some such system to education their children’. What struck them most was the comfort of English domestic life. While Ardaseer Cursetjee has been dubbed ‘the poster boy’ of Empire, a good example of how western education could uplift ‘natives’, his comments on what he found in Britain were not uniformly positive. [v] He castigated London’s ‘dirty roads’, comparing them unfavourably with those of Bombay. He considered cab drivers to be ‘an imposing and insolent set of men’ and was dismayed by the shopkeepers and tradesmen who had he found ‘a generally … unfair practice of speaking against one another in the same line of business which is the cause of great embarrassment to foreigners as they cannot have any confidence in dealing with them’. While travelling along the south coast inspecting shipyards, Ardaseer Cursetjee noticed an advertisement in The Times soliciting applications for the position of Chief Engineer and Inspector of Machinery at the steam factory and foundry in Bombay. He immediately returned to London and wrote from 21 Penny Fields in Poplar to the Secretary to the Honourable Court of Directors of East India Company offering himself as a candidate, submitting testimonials from Samuel Seaward with whom he had been studying and from the Institute of Civil Engineers, as well as from employers from the HM Dockyards at Woolwich, Chatham and Portsmouth. A month later the Court of Directors unanimously chose him for the job which he swiftly accepted. He was advised to return at the earliest possible practicable period. While he waited for the sailing of the Buckinghamshire in December, he made a brief sightseeing trip of Paris. Meanwhile the Court of Directors appointed the foremen for the factory, over whom he was to have control, the first Indian to be employed by the EIC as a manager of Europeans. On return to Bombay in April 1841 he promptly took up his new position in charge of the steam branch of the Indian Navy, aided by one chief assistant, four European foremen and staff of about one hundred European engineers and boiler makers, and about two hundred native artificers. The post carried a salary of Rs600 per month, more than seven times his then salary as Assistant Builder. Not everyone however approved of his appointment. The Bombay Times, doubted ‘the competency of a native, however able or educated, to take charge of such an establishment as the Bombay Steam Factory with a body of Englishmen to be directed, superintended and controlled’. It was a revelation to me that a fire worshipper could take tea like ordinary mortals. But he was a harmless lion, and roared very gently, and drank his tea and ate his bread and butter quite like other folks, and told us many interesting things of his life in Bombay. When he returned to Bombay in February 1853 he brought back with him some wood-cutting machinery from the United States, and probably other novel items, since he is credited with the introduction of photography and electroplating to Bombay. His own photograph was taken by Dr Hugh Welch Diamond (the son of an East India Company surgeon), and exhibited at the London Photographic Society’s show in Dundee in 1854 the same year the first photographic society was formed in India, of which Ardaseer Cursetjee was one of the founding members. [i] Kochhar, ‘Ardasseer Cursetjee’, p. 36. [ii] Alex Wernher, ‘Scaling London’s early XIXth century docks, bridges and manufacturies: Charles Dupin’s writings and technlogical change’, Documents pour l’histoire des techniques, 19/2 semester 201: les techniques et la technologie entre la France et la Grande-Bretagne XVII-XIX sicle, p.14. [iii] Jehangeer Nowrojee and Hirjeebhoy Merwanjee, Journal of a Residence of Two Years and a Half in Great Britain (London: Wm Allen and Co., 1841). [iv] The Mechanics’ Magazine, Museum, Register, Journal, and Gazette, 33 (1841), p. 285. [v] Quoted in Arvind Gupta, Bright Sparks, Inspiring Indian Scientists from the Past (New Delhi, 2009), p. 65. [vi] Caroline Howard King, When I Lived in Salem 1822-1866 (Vermont: Stephen Day Press, 1937), p. 59.